God Bless the souls of the victims of the attacks of 9/11, the families of those lost and the heroes who rushed to rescue the fallen and who still fight for America and all she represents. September 11, 2011. Tags: 9/11. Armed Forces, Pentagon, Terrorism. Comments off. God Bless the Troops and their Families who have given so much for us. May 30, 2011. Tags: Amazing Grace, LeeAnn Rimes, Memorial Day, The True Meaning of Memorial Day. Armed Forces, Pentagon. Comments off. Bibi speaks. God Bless Israel and her leadership. May 20, 2011. Tags: American foreign policy, Benjamin Netanyahu, Bibi Netanyahu speaks in White House, Obama Israel policy, Obama Middle East policy, PM Netanyahu. Armed Forces, Faith, Hillary Clinton, media, Obama Administration, Pentagon, Politics, Popular Culture, Terrorism. 1 comment. Waiting for Bibi’s comments to appear on youtube. Keep checking Bibi’s channel here. Stand with Israel. Thank you PM Netanyahu for speaking to the American people directly. We are with you. We will NEVER abandon Israel. No matter who is in the WH. The people of America will never allow it. May 20, 2011. Tags: American foreign policy, Bibi Netanyahu speaks in White House, Israel, Obama Israel policy, PM Netanyahu, US Foreign policy, US Middle East policy. Armed Forces, Hillary Clinton, media, Obama Administration, Pentagon, Politics, Popular Culture, Terrorism. Comments off. Update: HotAir has all the details. God Bless America. God Bless the troops who carried out the mission. God Bless the loved ones of those lost on 9/11 and in the battles since that day. Al Qaeda leader Osama bin Laden is dead, President Obama said. The U.S. has his body in its possession, U.S. officials said late Sunday…. May 1, 2011. Tags: AfPak, Bin Laden dead, foreign policy. Armed Forces, Pentagon, Terrorism. 2 comments. Yay Hillary. ’16 cannot come soon enough. 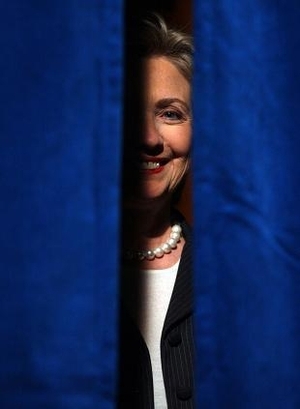 Secretary of State Hillary Clinton’s favorable rating from Americans is now 66%, up from 61% in July 2010 and her highest rating to date while serving in the Obama administration. The current rating is just one percentage point below her all-time high rating of 67%, from December 1998. ..more than 60% of Americans viewed her favorably in all three measures Gallup has taken since she assumed her State Department job, and she scored 65% in January 2009 just prior to President Barack Obama being sworn in. The latest results are from a March 25-27 Gallup poll conducted while the United States was actively involved in enforcing a no-fly zone over Libya, a policy Clinton reportedly advocated. The same poll finds Clinton rated more positively than other top administration officials. Obama receives a 54% favorable rating, Secretary of Defense Robert Gates, 52%, and Vice President Joe Biden, 46%…. March 31, 2011. Tags: Hillary 2016, Hillary favorability, Hillary gallup, Hillary leadership, Hillary poll ratings, Hillary Rodham Clinton, Libya, Obama Administration, Politics. Hillary Clinton, media, Obama Administration, Pentagon, Politics, Popular Culture. 1 comment.